The proposed rule for the 2019 Quality Payment Program (QPP) has arrived, and it shows that the QPP is continuing to ramp up. In 2017, 91% of MIPS eligible clinicians successfully participated, giving the Centers for Medicare and Medicaid Services (CMS) a green light to continue increasing the program requirements. At the same time, CMS has maintained certain measures of flexibility, particularly for small practices. Here we will outline some of the key changes and provide a comparison between 2018 MIPS and the 2019 proposal. Please note that all proposals for 2019 are still subject to change, and the final rule will not be released until later this autumn. 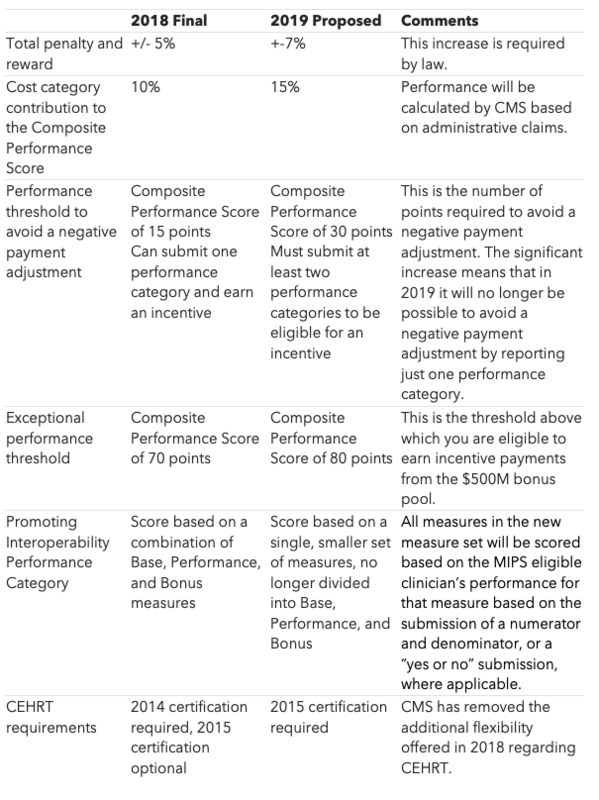 The Performance Threshold required to avoid a negative payment adjustment is proposed to double from 15 points to 30 points in 2019, and CMS is proposing that eligible clinicians and groups who submit less than two performance categories will not be eligible for incentive payments. This means that it will no longer be sufficient to only report improvement activities or Promoting Interoperability, which was a popular strategy to meet the Performance Thresholds in 2017 and 2018. The new Promoting Interoperability category (replacing ACI) will be overhauled, removing the Base, Performance, and Bonus points, and replacing them with a single, smaller set of measures which will all be evaluated based on performance. Along with this, CMS has proposed that 2015 CEHRT be required in 2019 in order to successfully participate in the Promoting Interoperability category. This means that eligible clinicians must upgrade their EHR to the 2015 CEHRT version and practices without EHR (i.e. still using paper processes) will not be eligible to participate in MIPS. This carries a 7% penalty in 2019. Additional clinician types are being added to the list of eligible clinicians. New clinician types proposed are physical therapists, occupational therapists, clinical social workers, and clinical psychologists. This seems to indicate that services provided by these new roles will be factored into the cost performance category. We will be looking for additional clarity in the final rule. The Cost category is increasing from 10% of the Composite Performance Score (CPS) to 15% of the CPS. The Quality category is decreasing from 50% to 45%. Remember cost and quality are the performance categories that will distinguish bonus earning, top performers from the rest. 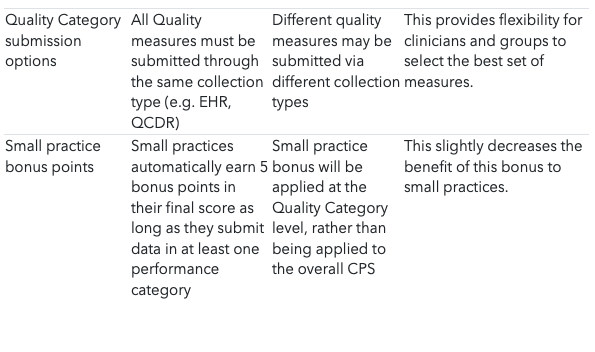 Eligible clinicians and groups will now be able to submit Quality data through multiple submission types (“submission type” is the new official term for “submission mechanism”). For example, a group or clinician may submit some measures through an EHR and some through a registry, and the measures will be scored together as part of one set. Facility-based Quality and Cost Performance Categories will be introduced, allowing facility-based groups and clinicians to be evaluated on the measure set for the Hospital Value-Based Purchasing (VBP) program. Which key requirements are proposed to increase?